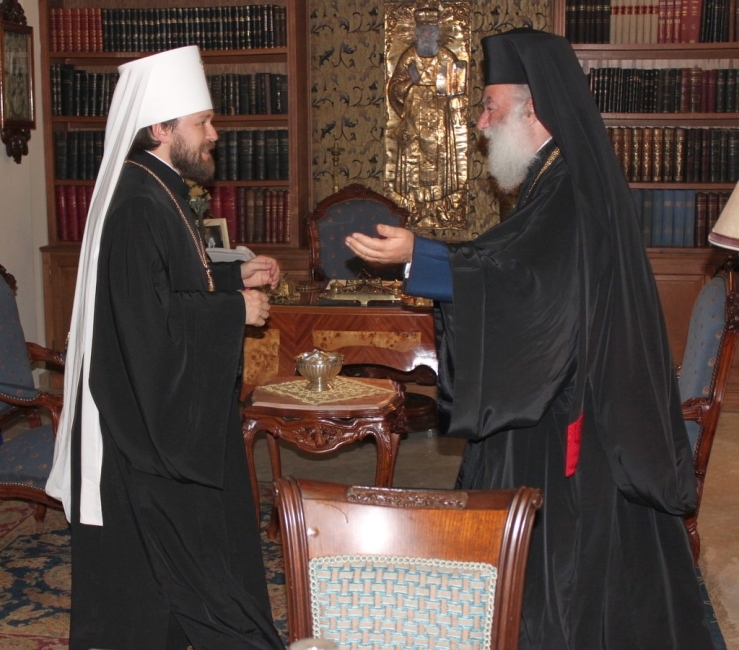 Metropolitan Hilarion of Volokolamsk, chairman of the Moscow Patriarchate’s Department for External Church Relations, congratulated His Beatitude Pope and Patriarch Theodoros II of Alexandria and All Africa on his Name Day. The text of the message is given below. I respectfully greet you with the commemoration day of your heavenly patron – the Holy Great Martyr Theodore the Tyron. It has always been a great honour and joy for the Russian Orthodox Church, to which you have given a part of your loving heart, to welcome Your Beatitude. Last summer, during the celebrations marking the 1025thanniversary of the Baptism of Russia, the Primate of the Apostolic See of St Mark led the assembly of the Primates and bishops of all Local Orthodox Churches in celebrating the Divine Services in Moscow, Kiev and Minsk. Those were memorable moments of the celebrations. We sympathize deeply with the Church of Alexandria, which is facing challenges nowadays. I hope that the relationships between our Patriarchates, based on mutual support in word and deed, will continue to develop. On this feast day, I share the joy of Your Beatitude and the whole assembly of the faithful concelebrating with you and prayerfully wish you good health and God’s help in your primatial ministry.